The outgoing Cork TD had said an army coup in Ireland was “real possibility”. His son has said he is “shocked” by the comments. THE IRISH DEFENCE FORCES and Micheál Martin have played down suggestions by outgoing TD Ned O’Keeffe that there is a possibility of a military coup in Ireland. O’Keeffe, a Fianna Fail TD for Cork East, caused a storm yesterday when he told the Cork Evening Echo that he thought an army coup was a “real possibility” because of the country’s economic problems. 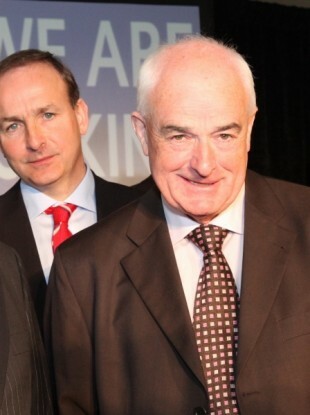 The retiring TD, whose son Kevin is running to fill his seat, later told TheJournal.ie that he stood by the comments. The Defence Forces serve the State every day of every year and we don’t involve ourselves in political matters. Absolutely not. I don’t know what’s happening in Kilworth [a village in Cork] but I don’t see any challenges in any shape or form. We have a great democracy in this country and this campaign bears that out. The Fianna Fail candidate for Cork East, Kevin O’Keeffe, would not return calls from TheJournal.ie for comment on his father’s views. I’m canvassing now and have no idea what he said. I’ll leave him to his own. I’m shocked. He can shoot away. Email “Defence Forces and Martin play down Ned O'Keeffe's 'army coup' comments ”. Feedback on “Defence Forces and Martin play down Ned O'Keeffe's 'army coup' comments ”.